My short stay in Waikiki was over and it was time to catch a cab. I had a very friendly Vietnamese taxi driver who was very chatty and polite and got me to the airport in good time. 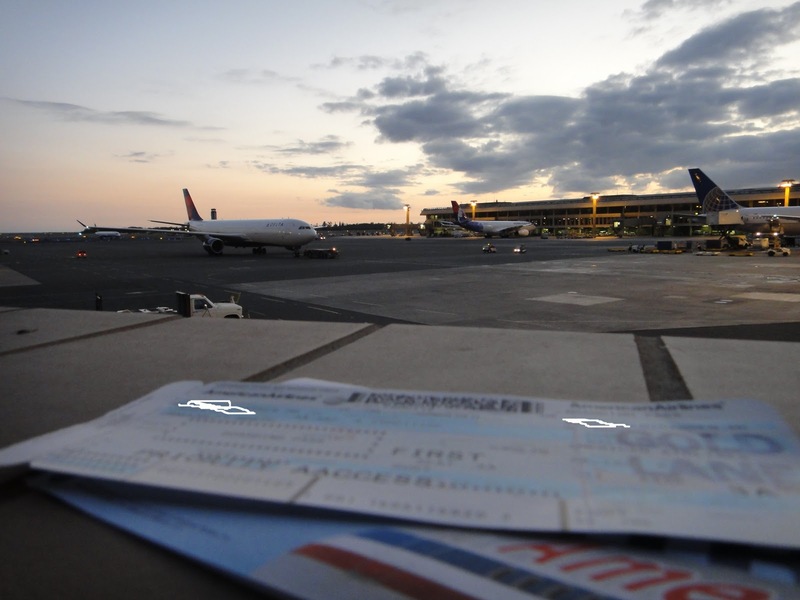 I was dropped off at the American Airlines check in area and I headed for the first class counter. 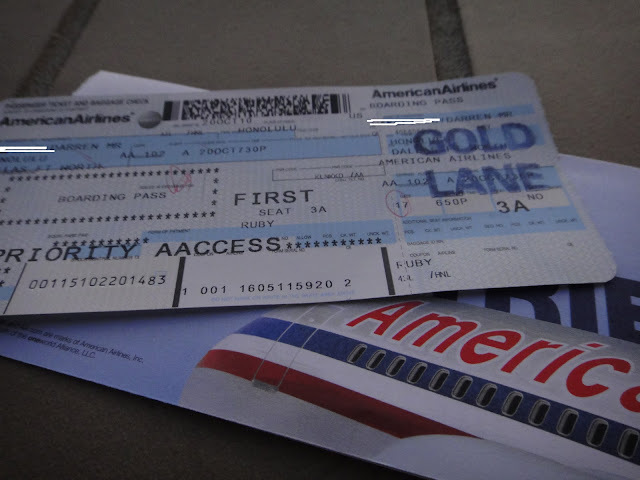 The check-in girl was a bit confused about my strange routing to Chicago (via Dallas and St Louis) but she checked me in efficiently and stamped my boarding pass with 'GOLD LANE'. My bags were tagged right through to Chicago and I was off to security. I used the priority lane but I was selected for a random secondary screening. After a full pat down my bags were carefully checked over and all my belongings were swabbed for explosives. My wallet was searched and two TSA agents made conversation with me about my routing. They asked why I didn't just take the direct AA flight to Chicago but they seemed to accept my reason (plane lover) and we had a bit of a laugh together. I must say they were both very polite! Security checks complete and with no lounge access I went for a walk around the terminal and grabbed a coffee at Starbucks. I was a bit early but with nothing else to do I went to the gate area and spotted our aircraft, N358AA.This is a Boeing 767-300ER delivered new to American in July 1988, making her just over 22 years old. I had selected this flight to take advantage of the angled lie flat seats on the 767 for the overnight red-eye to Dallas, it's far better than the 757's they use to Los Angeles! Boarding was announced on schedule and as usual First Class was boarded first, I was off on my first ever flight on American Airlines! I was seated in 3A which was actually the 2nd row in this aircraft. Sitting 2 seats across from me was another mileage runner! This guy must've been publicising his mileage running in the Admirals Club as quite a few passengers were talking to him about it. He was doing a 'turn around' having flown in from Dallas on the same aircraft with just a couple of hours in Honolulu at the Admirals club. On each seat was a cheap pair of ear phones, the menu, and a sealed plastic bag containing a rather nice duvet and big fluffy pillow. These aircraft are fitted with overhead entertainment only on domestic sectors. When used on long haul flights they have portable video players which slot into the seat back in front of you. I don't see why they don't offer this option for the 7 hour flights to Honolulu considering it is just as long as some international routes. Soon after I had settled into my seat I was offered a drink from a tray. There was sparkling wine and water on offer. I took a sparkling wine, in a plastic glass. I was new to this seat so I checked out and played with some of the seat controls. The control panel is found on the centre armest as you can see in this picture and is a pretty standard panel for these type of seats. They also have a massage option. One feature I really liked is that the entire seat can move forward or backward on the rails so you can easily get closer to the meal tray. You can make your meal tray extra large by pulling the panel down from the seat in front of you and connecting it to the fold out tray. Very nice. There are numerous audio channels available along with the video audio and you can select the channel from a small panel, again in the centre armrest. This is where you can press the call bell and light switch too. After dinner it was lights out and most of the passengers tried for some shut-eye. I managed a couple of hours sleep but spent a lot of time laying awake. The angled lie flat seat is reasonably comfortable but I still tend to have trouble sleeping on them anyway. The same applies to most flights I've been on, I rarely sleep for any significant period of time. Soon enough the descent commenced during a lovely sunrise. The clouds cleared as we approached Fort Worth airport and we made a nice approach into 'American Airlines Land'. I knew this was the main hub of AA, but it really is amazing to see just how many AA aircraft are on the ground at one time here. My aircraft taking a rest before she jets off to her next destination, perhaps back to Hawaii? I was pretty impressed by the domestic First Class service on this route. The flight is as long as many international flights at 7 hours and the quality of the meal and seat was of a good standard. The service during meal times was good but was very much absent during the between times, but this is often the case on overnight flights. My main complaint is, why not offer the Audio Video on Demand units on this route? For a 7 hour flight it should definitely be included. The one movie and various television shows on offer on the overhead screens didn't really cut it for me. Overall though, a pleasant flight.... now it's off to find my MD80 to St Louis! How did you get to Honolulu?